Replace those boring boughs of holly with these adorable Christmas-Caroling frosted acrylic ornaments. 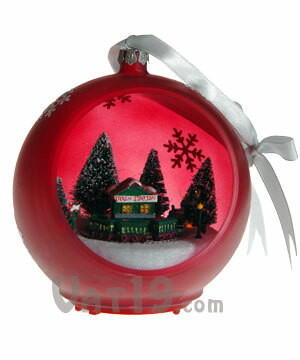 Each ornament can be displayed on a table or hung on the tree. When turned on, the inner holiday scene springs to life with a series of fiber optic lights and a collection of 25 Christmas carols. Available in two colors: Red and Green. Features two volume settings. Batteries are included. The Musical Sparkling Ornament features a flat bottom so that it can be rested easily on any flat surface. Set it on a living room table, turn it on, and enjoy the beautiful ambiance of this frosted ornament as it plays 25 different Christmas carols. 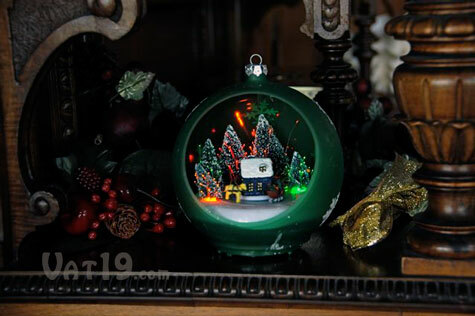 The green Musical Sparkling Ornament features a moving sleigh ride scene. 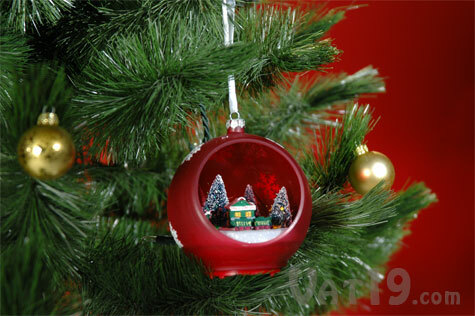 These attractive ornaments come packaged with a satin bow for easy tree hanging. The red Musical Sparkling Ornament features a moving train circling its station.